Having Fun with Guns the Second Time Around! Gearbox Software’s hit “space western first-person shooter” Borderlands is back for another round, promising you more guns, more loot and more action. The western themed, bandit-ridden, monster crawling world of Pandora is still offering prospective vault hunters the opportunity to make a killing, both figuratively and literally. But with the initial Borderlands title being loved for its quirky nature there really can’t be much more that Gearbox can add. Still, Borderlands 2 is promising that same unique nature that fans grew to love as well as a fistful of new and updated content. Oh, and a lot more guns. We can’t forget the guns. It seems that Gearbox have opted for slight changes with this sequel rather than a major overhaul, and why wouldn’t they? There’s no need to fix it if it isn’t broken. The first difference can be found in the class system. Although the base follows similar lines as the original title, Borderlands 2 offers the player a much more intricate skill tree. This will hopefully enable better developed characters allowing players to customize their class to suit their playing style. No matter what, the Commando will still be the tech-class, the Gunzerker will be the tank-class, the Siren will be the power-class and the Assassin will be the rogue-class. However the improved skill tree promises to allow players to create their own specifically designed sub-class. Perhaps you like playing sneakily but enjoy a bit of hand to hand combat, the skill tree will hook you up. Your class may no longer be considered a boundary as Gearbox promises a class to cater for any playing style. Borderlands 2 also offers a host of mini skill based challenges which will allow for greater character customization and development. This will be based on statistics such as number of kills, headshots, shot accuracy and the like. All of these challenges will add up allowing the player to improve such attributes as reload speed and weapons damage. Initially the tokens received from these challenges are relatively small, but as you tot them all up, they will make a real difference to the potency of your character. There have been reports of 87 bazillion possible gun combinations. That’s a lot of guns. More guns than Rambo keeps in his lock-up I’d imagine. The gun collection was one of the best factors of the original title. There was no better feeling than stumbling upon a new, more awesome gun. But there was always a special place in my heart for my favourite gun. I’m afraid the other 86.999 bazillion guns will have to wait their turn. Borderlands 2 not only promises a tonne of guns but it also heralds the return of co-operative play at its best. Borderlands can be played split-screen, online and via a LAN connection. What’s the point in finding bazillions of guns if you can’t share them with your friends? 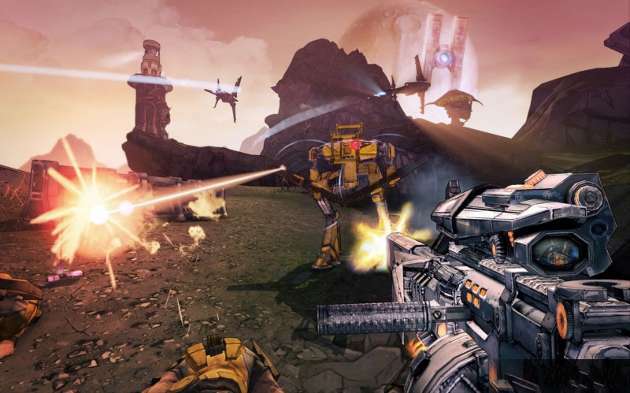 Borderlands 2 is setting up to be a fantastic addition to Gearbox’s repertoire. Although it isn’t offering much in the realm of “new” it is still offering a return to the key fundamentals that so many fell in love with. Plus a few extra bits to keep us all on the edge of our seats in anticipation for its September 18th release. I went Gunzerker in the origional title and was not dissapointed. 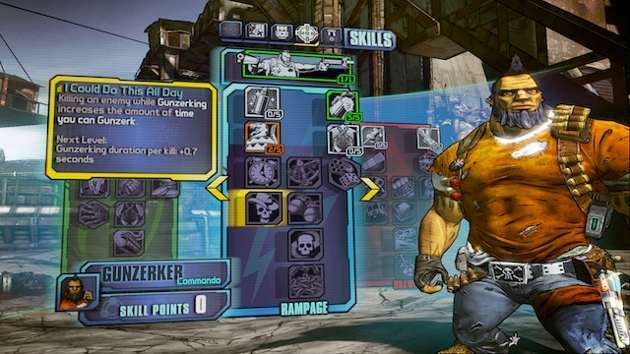 Think I’m going to stick to my guns … zerker, in Borderlands 2!